Cormac hails from the frozen lands of the north, a harsh and demanding countryside that yields a hardy and proud people. For generations, the factious barbarian tribes would wage war over the few available resources. To make matters worse, the lands were rife with all sorts of monsters – not to mention the Ice Giants who would invade regularly from high in the mountains. That was until Cormac’s grandfather, Killian, raised an army and with it conquered the other tribes. As each tribe fell he offered their leaders a place in his tent. In time he built an alliance strong enough to end the petty squabbles. Killian forged a time of peace, drawing together many banners under one ruling council. Songs of the valor and wisdom of Killian the Tribeforger are still sung in the halls of Cormac’s people. Cormac’s mother, Navlyn, had her turn to earn a place in legend. The peace brought on by Killian and the council was broken when the Ice Giants of the mountains descended upon the tribes. United under a common banner and with Navlyn’s leadership the barbarian tribes waged war against the giants. Even bards from the kingdoms to the south know the stories of the one-armed barbarian queen Navlyn the Giantslayer. After defeating the Ice Giants, Navlyn’s warriors vanquished the remaining monsters that still plagued the north lands, guaranteeing a lasting peace for the barbarian tribes. In Cormac’s lifetime, there have been no great wars to fight or harrowing beasts to slay. The “barbarians” have settled down – ending hundreds of years of nomadic tradition. The people started to keep cattle and cultivate the land where they used to hunt and forage for food. They even started constructing walled cities! Cormac was raised on the songs of his kin. He was fascinated by the the stories of warrior-chieftains, and especially the accounts of his mother’s and grandfather’s deeds. Cormac longed for the warrior’s way of life but found himself spending his days as a chieftain’s son, presiding over council meetings and discussing trade agreements. This would not do! Cormac, Son of Navlyn declared that he would be known as Cormac the Mighty. He struck out into the world to make his name, following in the traditions of his ancestors. Over five years, his quest took him far to the south. He slew dragons and giants alike, and earned his self-proclaimed title. Yet he never believed that he accomplished anything worthy of his mother’s or grandfather’s legacy. His quest lost its meaning. Cormac was a hollow and misguided man when the party met him. He had become a drunkard and a brawler… fighting in pits for the amusement of others. Deirdre took pity on this once-great warrior. Seeing the spark of adventure dimming in his eyes she insisted that he come along with them on their next quest. Journeying with the party rekindled Cormac’s pride, and with it his ferocity and prowess. He had found new purpose, and companions who were his equal. Cormac the Mighty does not know if there will be songs sung of his adventures when he returns one day to take his mother’s place as chieftain – but he does know that the band of heroes he journeys with is worthy of them. The Guide to Inns and Taverns is our comprehensive guide to adding interesting locations to your campaigns so your adventurers can eat, drink and be merry! Part of that book was including a complete list of all of the specialty drinks you could find at the Red Dragon Inn. In order to keep that list up to date, here are the two official drinks that were released as promos through the Red Dragon Inn 4 Kickstarter. A little confused about terms like “alcohol effect”? In addition to the detailed stat blocks for these and various other drinks, we also included in-depth rules for how characters get inebriated during a round of drinking. This includes new Pathfinder compatible conditions, rules about sobering up, hangovers, and how magic and alcohol mix (or don’t!). You can find out more about The Guide here. So, without further ado, on to those new drinks! 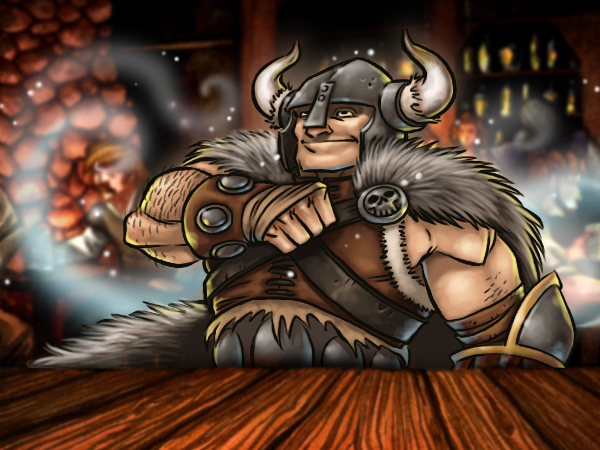 Chieftain’s Ice Beer is a right of passage for men and women of the northern barbarian kingdom. Legend tells that the Chieftains of old would meet over a fresh batch of Ice Beer, challenging one another to a drinking contest. The young Chief Killian, as the story goes, not only bested all challengers, but never felt the ill effects of the brew on the morning after. 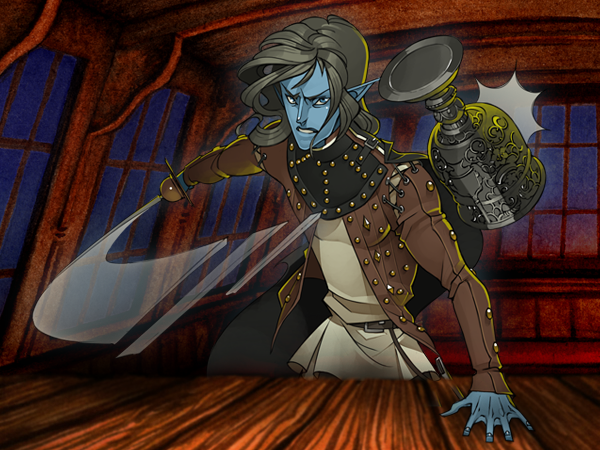 Killian would later become the Chief of Chiefs, and his clan’s recipe for Ice Beer became the standard among the tribes. Brewed by fermenting steppe vegetables and then allowing the water content to freeze off, this “beer” is more of a distilled spirit. The remaining liquor is then mixed with various spices, sampled, and diluted with water again to create a refreshing yet full-bodied beverage. Boys and girls among the barbarian tribes drink this brew to prove their vigor. Effect: Once, while the creature remains intoxicated, they may cast a 0-level spell as though it was affected by the Empowered Spell (Metamagic) feat. Doing so immediately reduces the creature’s level of intoxication by one. If this causes the creature to become sober, then the creature must make a hangover check with +5 Difficulty. Witchdoctor Brew is a powerful alcohol brewed exclusively in a small valley that is the home to a tribe of “civilized” trolls. While they do not typically practice their traditional arts nowadays, they have adapted many of them for more sophisticated crafts. The origins of this ale hail from a deep shamanic tradition of crafting potions that would poison the body and liberate the spirit. 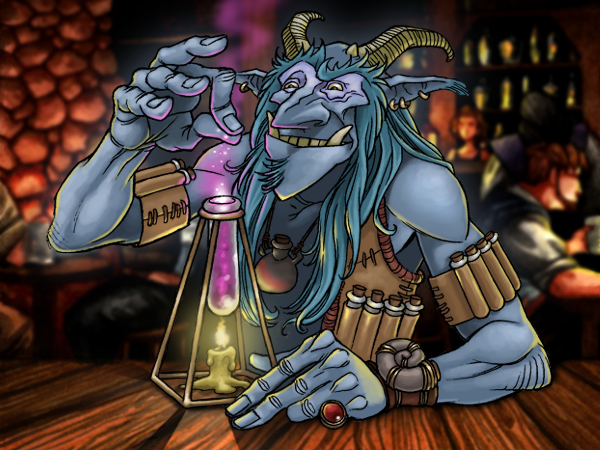 While most folk don’t have the constitution to survive the troll’s more potent beverages, the tribe asserts that Witchdoctor Brew is perfectly safe-ish. Years ago, across the Great Sea, Remy was a soldier and deckhand on a mighty warship. When the crew of this ship, weary of ceaseless battles, mutinied, Remy’s honor demanded he draw his sword in defense of the officers. The mutiny succeeded, Remy found himself in the brig, and the new crew turned the ship towards the open sea… with hopes to find the fabled lands of the West. The journey was plagued by storms and rough seas, but it was a kraken that spelled its final doom. Somehow, Remy survived, but was left alone, adrift on the waves. Fate smiled on Remy. He found himself aboard a foreign ship surrounded by sailors from lands he did not know. He pledged to serve the men who rescued him. Alas, fate can be tricky; Remy had been picked up by pirates… and his honor demanded that he be a pirate as well. Remy spent years serving as a pirate, proving his mettle and loyalty, and eventually earning a place at the captain’s side. He despised what he had become. There was no satisfaction or honor in preying on the weak, in murdering merchants and other sailors for their gold or cargo. But he had no choice. Then he met Elizabeth Whitehawk. Something about her struck him and for the first time ever (and last time since), he chose to break an oath. He sided with Elizabeth and helped her defeat the pirate crew. This time he was the mutineer! Remy has been serving as First Mate to Captain Whitehawk ever since. He still longs to return to his home in the east, but even if he could find a ship and captain able to make the crossing, he doesn’t know if he would be welcomed or put to death as a mutineer… and this conflict weighs heavy on him always. Natyli and Phrenk both hail from a tribe of surprisingly civilized trolls. Phrenk was intrigued by The Party when he found them to be very reasonable people, willing to see through typical racial stereotypes. He decided to join them after they helped negotiate a peace between his tribe and the humans who began taking residence in a nearby valley. He’s been brewing potions and sharing the alchemical science of his tribe with the Party ever since. Natyli is an adolescent troll with a gift for her tribe’s ancestral magic. While the tribe no longer adheres to these old ways anymore, a few of the elder trolls still practiced the traditional magic. It was unexpected to find a child born who was so capable with the magic; Natyli did not have to study very hard to master the old curses, jinxes, and hexes. As she grew older, and more imaginative, she found that she could have a great deal of fun by playing tricks on her tribemates. 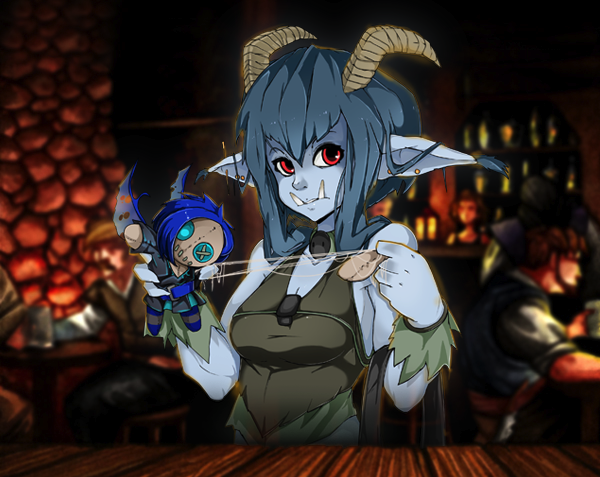 Days would go by where she would do nothing but sew together detailed effigies of her friends and “enemies” and arrange them into elaborate situations for her amusement. While she was careful not to cause any lasting harm – and remember, “lasting harm” for Trolls is often lethal for less durable folk – she certainly was not winning any favor amongst the tribe. She often found herself being ridiculed and punished by her seniors, only to not learn her lesson and go back to seeking revenge with her voodoo. Tensions between the tribe and Natyli escalated, and talk of exile started to be whispered between the older trolls. Still, Natyli was too naive to consider the ramifications of her actions, as she kept making trouble. Even the elders who had been so pleased to see a child who could continue the traditions acknowledged the need to take action. In the years while Phrenk was with the party, he had traveled quite nearly across the entire continent and been part of more adventures than he could easily keep track off. Whenever he could he would visit the tribe and tell grand stories of his journeys. Natyli loved the tales of adventure and far away lands. She always wanted to hear more. While he was spending time with the elders, Phrenk learned about what a little terror his niece had been with her witchdoctor magic, and a brilliant idea struck the grizzled troll. To save his niece the shame of exile, he elected to take responsibility for her, and invited her to join The Party on their adventures, a deal Natyli and the tribe overwhelmingly agreed to. In Phrenk’s opinion, Natyli will grow out of her current “do unto others before they do unto you” phase soon enough. But for now, she can put her imagination and talent to use in a more productive way, hexing monsters and helping defeat villains. Of course, that doesn’t stop her from turning her magic on The Party from time to time. But they’re used to troublesome party members; after all, Serena and Gog were way more trouble when they first joined the party. Or, at least that’s what they keep telling themselves! New Allies in Store Now! The Red Dragon Inn: Allies Brother Bastian and Ozrik the Adept are now available at your favorite retailer. 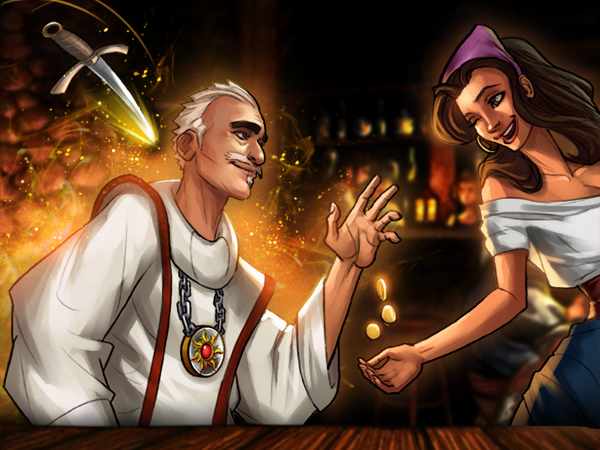 Now is your chance to add these new player characters to your favorite copy of The Red Dragon Inn! Not familiar with Allies? They are single character expansions to any of the four character box sets of The Red Dragon Inn. Each of them include their own player board, deck and bits to add an additional player to your game. They are compatible with any set, just like all of the Red Dragon Inn characters! Can’t wait, and have to order them now? Check them out on the Red Dragon Inn Products Page! The Bad: Unfortunately, because he knows so many prayers, you never know what he’s planning next. Brother Bastian introduces a new prayer mechanic to the game, letting him make sacrifices to earn powerful card effects! 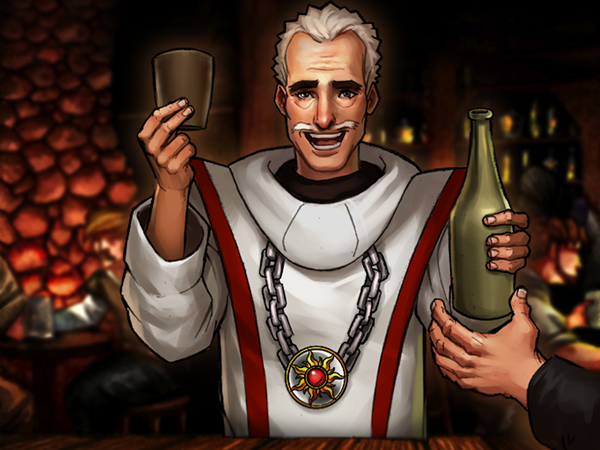 You can find out more about Brother Bastian on our blog post about his mechanics: Playing Brother Bastian. After years spent in the pursuit of elemental power during which Ozrik caused a great deal of damage, he realized he had literally burned bridges behind him. Now he travels the world as an adventurer. He’s still causing damage… only now he’s doing it for the right reasons! The Good: Ozrik’s phenomenal control of the elements is useful versus undead, monstrous humanoids, and other evil dungeon dwellers. The Bad: Side effects for Ozrik’s companions may include spontaneous combustion, static discharge, and clammy hands. Ozrik literally burns (okay, discards) cards from his hand to get more power! 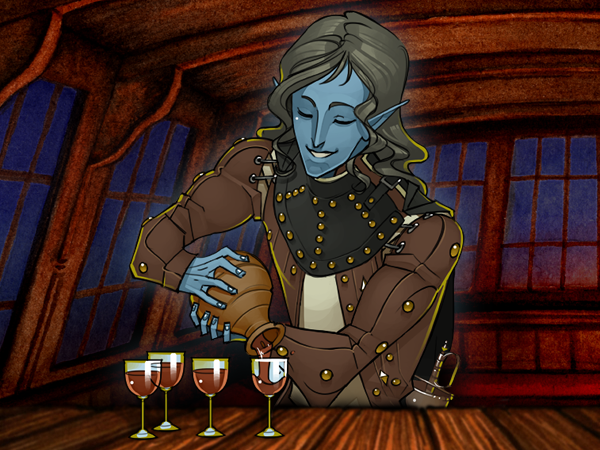 With his technicolor deck, he can harness the elements to do his bidding, and serve up a nasty drink or two! You can find out more about Ozrik the Adept on our blog post about his mechanics: Playing Ozrik the Adept. Phrenk is not your typical troll. In fact, if his entire tribe weren’t made up of trolls, you wouldn’t guess that there was a troll among them. Usually trolls are mean, angry monsters who maliciously terrorize smaller folk. Nobody is exactly sure why – perhaps quasi-immortality drives them mad or constantly getting hurt and suffering through regrowing limbs is unbearable. Maybe they are just fed up with how everyone gives them a hard time for looking kinda scary. Regardless, Phrenk and his clansfolk simply weren’t your garden-variety trolls. They used to be, though. They still tell stories – when only in troll company – about their ancestors who were more typical of how bards describe them. That all changed, however, when the nomadic tribe settled around a stony outcropping in the forest they now call home. What makes these trolls different from all the evil trolls in the world is that they made the unique decision to settle down. They weren’t precisely sure who suggested the idea, but they all knew why it was a smart idea: one really big rock. It was a peculiar, rectangular rock of glittering black stone driven into the ground at a steep – though climbable – angle. It was in the middle of a clearing deep in the forest and it was tall. Anyone standing atop it could easily survey the landscape from the bottom of the valley all the way out to the hills and mountainsides. In fact, when you touched the surface with bare skin, you seemed more acutely aware of your surroundings in general. The tribe took to posting their watch atop the rock, where three trolls could comfortably stand vigil throughout the night. Over the years, the tribe realized that the Vigil Stone – what they came to call it – had some manner of magic about it. They learned that anyone who touched the stone didn’t seem more perceptive, they actually were more perceptive. The Wardens, those who stood watch atop the stone, could pick out the best hunting grounds from their perch. When one area would run dry, they knew where the next richest lands would be. The tribe was also making better tools and having more creative ideas. By the time Phrenk was born, they had begun keeping herds of deer from the forest and goats from the hillsides, erected woven timber lodges with foundations of river stone and animal hide roofs, and were following the stars to keep track of the seasons. Phrenk was born to a family of shamans with deep spiritual traditions. While the trolls still practiced ancestor worship, tribal magic, and maintained their rich oral tradition, the ritual sacrifices and poison craft had evolved considerably. Mainly, they didn’t do ritual sacrifices anymore, and their poison craft had grown to encompass beneficial medicine and the foundations of alchemy as well. Phrenk was a savant at brewing. He was the first to begin cataloging the local flora and fauna, even adapted the tribe’s shamanic runes as a means of naming and keeping track of his findings (he wouldn’t learn Common until much later). While he continued developing his craft, he engaged – sort of – in the other aspects of village life. All trolls, male and female, were expected to serve in all roles of the tribe. Back when they were nomads, this simply meant that all trolls were expected to hunt and gather food. Now that they were sedentary, there were many more jobs that needed to be taken care of around the village, like building huts and lodges or tending to the flocks. Phrenk’s passion, however, was in his concoctions, and he often shirked other obligations to spend time brewing – and recovering from testing – his own tinctures. He became something of a joke among the trolls of his village. He was seen as dull, good for nothing, always incapacitated or struck dumb by the poisons he kept exposing himself to and never ready to take on the tasks at hand. When Phrenk discovered the art of distillation, his responsibilities were all but forgotten and his reputation soured further. He made liquors and spirits from everything he could find. 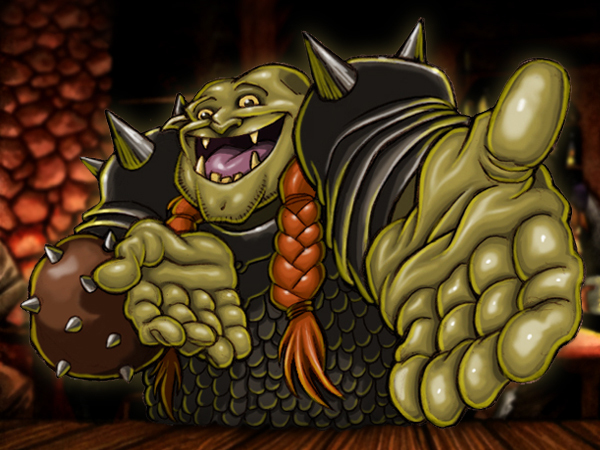 Taken pure, these could knock out a troll – even with their rapid metabolism! But once they were properly diluted and combined with one another, his ingredients became the most potent the tribe had ever seen, and his potions were far more advanced than anything his peers could achieve. Once he shared his findings, the tribe was able to forgive his laid-back and lazy reputation. It was clear that he was a savant, brilliant and far beyond even their eldest shamans in their craft. Phrenk was allowed to devote himself completely to his studies, something he took to with relish. Over the decades, Phrenk grew to become a well-respected member of the village. He taught his style of potion brewing to other interested trolls and even started taking on the responsibilities of being an Elder in their growing council. The trolls had begun studying the Vigil Stone, and had already determined that it was responsible for their rapid development as a “civilized” people. They did not worship the rock, but they did come to respect it, and consider its origins. They also found that it was poisonous over time, and that creatures that didn’t possess a Troll’s resilience eventually succumbed to its effects. This wasn’t really a problem for the village – they just kept the livestock far away from it. It became a problem, though, after scouts and mercenaries from a human kingdom started coming into their valley. Phrenk first met The Party after he had been an Elder for decades. They came with the task of clearing out those “troll barbarians” who were disrupting the expansion of a minor noble’s holdings. They weren’t the first band of adventures that the tribe had had to deal with, but they were the first to come for a talk rather than a fight. Their attitude left a good impression on Phrenk, and before they were dismissed he threw his weight in behind them as one of the oldest trolls of the village. After that, they had to be heard out, and talked to as friends. The Elders described the peculiar issue of the Vigil Stone. They could not leave it, because it had helped the tribe so much, and it was dangerous to humans and others like them. It was also far too large to safely move, something that they had considered doing already – after all, even though the valley was nice, it was not as ideal as some of the other locations in the mountain range. That gave Zot an idea, and after sending for Dimli – for they needed his dwarven ingenuity – the party arranged to move the Vigil Stone for the tribe. The Elders agreed with the plan, and after little more than a week of surveying, troll scouts returned with a fantastic location to rebuild the village. After the relocation, it took only a month for an armistice between the troll village and the nearby lord was drawn. The trolls were happy to share their knowledge of the land, within reason, with other civilized folk, they just demanded that their borders be respected. After trade had been established between them and the noble’s holdings, things grew amicable quickly, in large part due to the quality of liquors and bitters, not to mention magical ingredients the tribe was happy to sell. Phrenk joined The Party soon after the tensions between the human expansionists and his village settled down. He respected their open-mindedness and attitude – it also helped that Deirdre brought him his first quality alchemist’s kit as a thank-you for his cooperation. Besides, joining The Party was an opportunity for Phrenk to travel and perhaps change the minds of other folk who mistook all trolls for brutish monsters. Heroes’ Plunder for Gambling? I’m In! The Rogues and Warriors deck from Gambling? I’m In! (GII) is one of the staples of SlugFest Staff road trips. We played a ton of games of chance throughout the trip to Gen Con and back home. We are always trying out new games and variants, and are proud to release yet another game for GII: Heroes’ Plunder! In Heroes’ Plunder, you are a member of a band of adventurers who are divvying up the loot from a recent quest. During the game, you will be passing piles of loot between players, taking one piece at a time for yourself. The player with the most lucrative sets of loot wins. Each player is dealt a hand of 8 cards from the Rogues and Warriors Deck. Each player picks one card from their hand and adds it face down to their pool. Each player passes their remaining hand to the left. Repeat steps 3 and 4 until players are passed a hand of exactly 2 cards. Each player picks one of these two cards, adds it to their pool, and then discards the second one face down to a common pile. Each player is then dealt a second hand of 8 cards from the Rogues and Warriors Deck. Repeat steps 3 through 6 passing to the right instead of to the left. Players reveal their pool of 14 cards and the winner is determined. The player with the highest scoring pool wins. 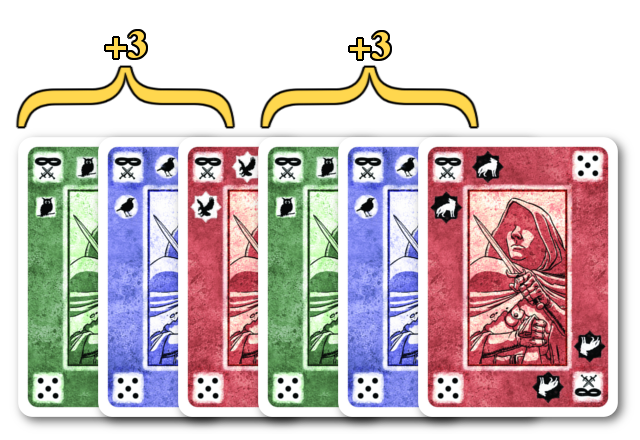 Cards score points based on how well they combine with other cards in your hand. 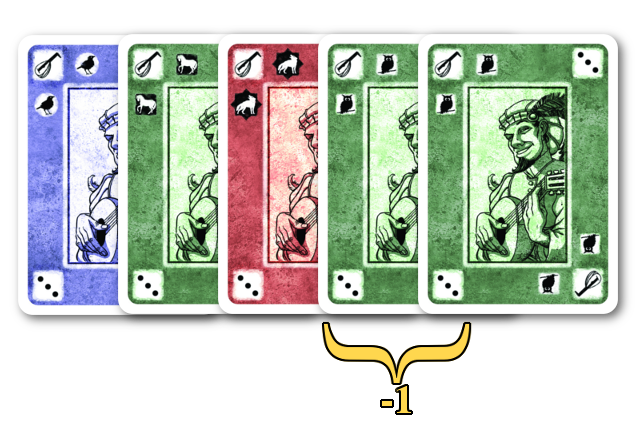 Players earn 1 point for each card belonging to a completed Rank Set. A Rank Set is complete if it has exactly as many cards in it as there are pips on its rank (1 for Warriors, 2 for Ladies, 3 for Bards and so on). It is possible to have multiple completed Rank Sets of the same rank (10 Rogues would be two complete Rank Sets). 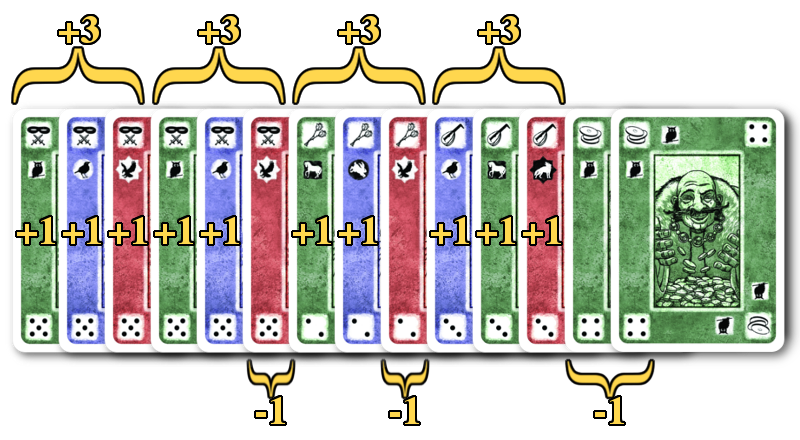 Each set of cards of a given rank that is not part of a complete Rank Set reduces your total score by 1, regardless of how many cards are in that incomplete set. So, for example, 4 Rogues only causes you to lose 1 point. It is possible to have both a complete Rank Set and an incomplete one for a given rank. So, for example, 7 Rogues would be one complete Rank Set worth 5 points and one incomplete set worth -1 point. Each card in your pool belonging to a rank with which you have scored AT LEAST ONE complete Rank Set can contribute to a Color Set. Score 3 points for each set of three colors you can build in each rank. (i.e. 2 blue Rogues, 2 red Rogues, and 2 green Rogues would score you 5 points for the Rank Set, -1 point for the incomplete set, and 6 more points for the two color sets of blue, red, and green). In this example, only three of the five Bards score for a completed Rank Set, providing a total score of 3. If this pool had just one more Bard, the two extras would have scored for a second complete Rank Set. Because there are two Bards that do not belong to a completed Rank Set, this pool suffers a penalty of -1 point. Notice that regardless of how many extra Bards there are in this pool, there is only one penalty point earned for the incomplete rank. Because this pool contains at least one complete Rank Set of five Rogues, Rogues will score for color sets. There are two complete sets of three colors among the six Rogues so this pool earns 6 points for its color sets. In this example, there is a complete Rank Set of Rogues (5 points), Bards (3 points) and Ladies (2 points) for a total of 10 points on Rank Sets. Among the Rogues, Bards and Ladies there are also four complete Color Sets earning the pool another 12 points. Unfortunately, there is also an extra Rogue, Lady and two Merchants making three incomplete Rank Sets for a total penalty of -3 points. This pool of cards is worth a total of 19 points. A Dragon in your pool does not belong to any Rank Sets. A Dragon can be added to a Color Set of any rank. It counts as a card of that rank in that Dragon’s color. Dragons never cause you to take Penalty points. The Red Dragon allows you to steal a non-Dragon card from another player’s pool. However, the stolen card may only come from a rank that has at least one incomplete Rank Set. Player’s may rearrange their Rank Sets after the Red Dragon’s Effect. A player that has no incomplete Rank Sets is immune to the Red Dragon! For example, you can take the sixth Rogue from a player’s pool. The Green Dragon counts as any rank for completing one Rank Set. For example, you can make a Rank Set of Rogues with 4 Rogues and the Green Dragon. The Blue Dragon allows you to score Color Sets using any combination of ranks. For example, you can make a Color Set with a Blue Rogue, Red Merchant, and Green Lady. The three dragons resolve in the following order: Red first, Green second and Blue last. SlugFest Games is proud to announce the official release of RDI:A – Ozrik the Adept and RDI:A – Brother Bastian. Be sure to check with your friendly local game store, as they will both be available in a few weeks. SlugFest Games (“SFG”) announced today that they will release two new products for their Red Dragon Inn (“RDI”) line of fantasy card games. These two new releases will feature single character decks for RDI, bringing new mechanics to the game as well as increased expandability. The Red Dragon Inn: Allies – Ozrik the Adept and The Red Dragon Inn: Allies – Brother Bastian will be available for solicitation September 11th, 2014 for orders to start shipping the following week. 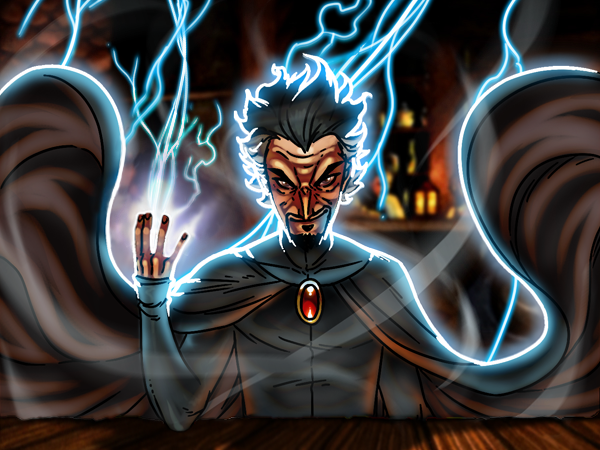 Description:The Red Dragon Inn: Allies – Ozrik the Adept expands the party at the Red Dragon Inn with a brand new elementalist who is a master of manipulating his abilities. Many of Ozrik’s cards have more powerful effects if you discard other cards from your hand. Carefully managing your hand to build these powerful combos will be the key to victory in any tavern brawl! Description: The Red Dragon Inn: Allies – Brother Bastian expands the party at the Red Dragon Inn with a brand new character! Bastian brings powerful prayer cards with him, giving him great flexibility. Making sacrifices throughout the game so you can use your prayers at the perfect moment will lead you to victory! SlugFest Games has been in the gaming industry for 10 years. They have focused on making games with simple, fun mechanics that are dripping with theme. Their games are quick to learn, fast to play, but have a surprising depth of strategy. They strive to infuse humor into their games, ensuring you’ll be laughing even if you don’t come out on top. The Red Dragon Inn: Allies – Ozrik the Adept and The Red Dragon Inn: Allies – Brother Bastian © SlugFest Games, Inc. 2014. SlugFest Games, The Red Dragon Inn, and all associated materials are either TM and/or © SlugFest Games, Inc. 2003-2014. All rights reserved.